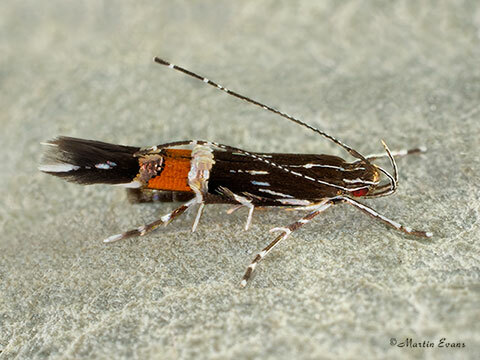 Back in July 2012 Roger discovered Cosmopterix pulchrimella leaf mines on Pellitory-of-the-Wall at a site near Mevagissey in Cornwall. We reared them through and they produced adults just a few weeks later in early August. While we were visiting the same site on 12th August this year Roger found them again and I decided to rear one through to see if I could get better pictures of this small moth. 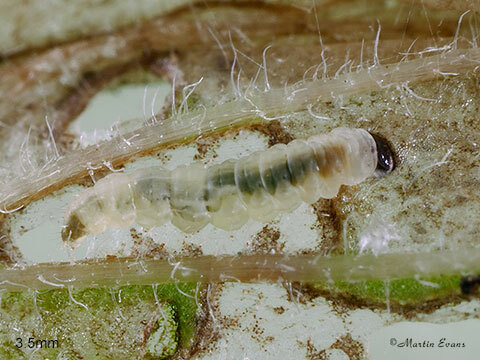 The next day at home I was surprised to find that there were three larvae on the small sprig of the plant that I had brought home, and the leaf containing the original larva was almost totally mined and the larva was sitting on its surface. 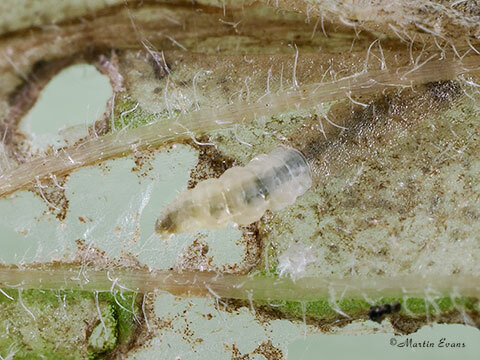 A second slightly smaller larva was still in the mined base of another leaf and a third tiny larva was within one of the axillary buds at the base of a leaf. 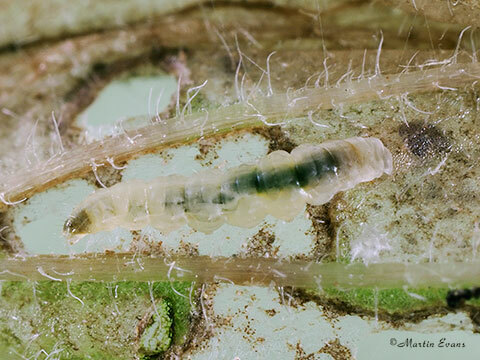 While photographing the largest (3.5mm) larva I realised that it was chewing the leaf surface, and while I watched it started to re-enter the mine as you can see in the three pictures below. 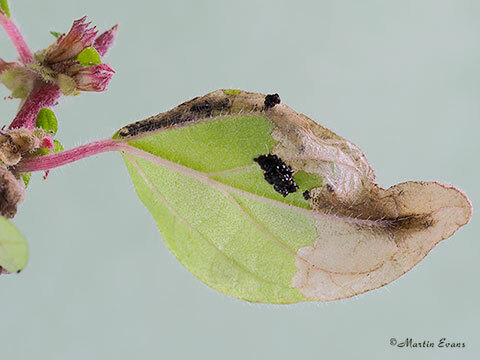 The day after photographing the larva re-entering the leaf mine, I discovered it had formed a new mine in the leaf containing the second larva, and had already mined nearly half of the leaf tip. Top of leaf: An initial mine containing a larva. Right of leaf: The larva in a secondary mine. 17 days later on 30th August, an adult emerged from the larger mine in the picture above. This moth had a forewing length of about 4mm. The species was first discovered in 2001 in Dorset and is now found at many sites along the south coast from Cornwall to Sussex , the Isles of Scilly, the Isle of Wight and also at inland sites in southern England. The moth was previously known from the Channel Islands. In captivity adults have emerged from mines in late winter. Wild adults have been recorded in June and there are many sightings of adults in late autumn, so the species may be continually brooded. 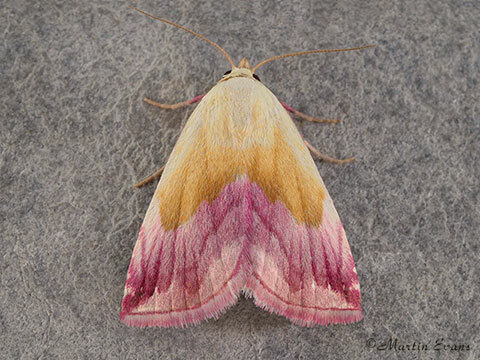 On Thursday 20th July, Roger and I set out on a mothing trip to Suffolk. We had booked a farm cottage for a week at Sudbourne, which is about a mile inland from Orford Ness. Although the cottage was booked from the 21st, we decided to leave a day early and travel the scenic route to get there, via Dungeness in Kent. During the evening we trapped in some woodland near Ashford, Kent, but did not have much luck, as by midnight the temperature had dropped to 9C and the moths were only trickling in, so we decided to continue our journey to Dungeness and then try and get a couple of hours sleep in the van. We had pre-arranged to be present when the wardens at the bird observatory were opening their two MV traps at 6.00 am. Despite a cool windy night there were several moths in the traps that neither Roger or myself had seen before, including local specialities such as Ethmia bipunctella, Coleophora galbulipennella, Cynaeda dentalis, Pigmy Footman, Langmaid's Yellow Underwing and a Toadflax Brocade. There were also some migrants in their fridge from the previous night, including a Pale Shoulder and a Scarce Bordered Straw. We were already happy with the number of new moths photographed, as we had already agreed that we would be very pleased if we gained photos of half a dozen new macro-moths during the whole week. After leaving the observatory we travelled on to a local private residence where we had been told by the wardens that we would be welcomed if we visited and said we were interested in moths. As it happened we were a bit early and decided to return an hour later. As forecasted we received a warm welcome. On opening the traps we saw a large number of Pigmy Footman and I was very pleased to be able to photograph my first Pale Grass Eggar. Again there were migrants in the fridge. This time two Speckled Footman and a Tamarisk Peacock (the latter moth and one of the footman were caught by other local moth recorders). It was still only mid-morning when we left to continue our journey up to Suffolk. After this success we were wondering whether we should have booked a place to stay in the Dungeness area. After a slow journey across the Dartford pass we got off of the M25 and travelled relatively quickly on to our destination. Despite poor weather (either clear cold nights, wind or rain), we trapped every night and were rewarded with Agdistis bennetii at three sites, Donacaula_mucronellus, two V-Moth, Ground Lackey at three sites including a female in the garden of the cottage where we were staying, Plain Pug, Bordered Pug, a rather worn Star-wort that Roger found by searching Ragwort blooms, Tawny Shears and two Lesser-spotted Pinion. Perhaps our most exciting night was the warmest, but also the windiest night of the week which was the 26th July. It was so windy that we decided that we would not leave an MV running in the garden as we had on the other nights, but to leave a 20w compact UV fluorescent hung up in a sheltered downstairs window at the back of the house. On this particular night we were going to the coast to a site where Tree-lichen Beauty had been caught regularly in the past. Our first task on arrival at the site was to find some shelter from the wind as it was blowing along the beach. We found some scrub and set up three compact fluorescent UV lights on sheets with egg boxes stacked around the lights. Within a short while Roger had caught the first Tree-lichen Beauty. 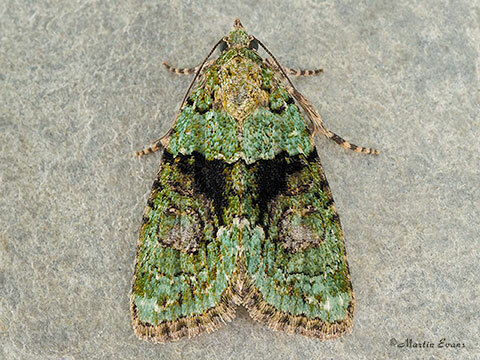 It was in very good condition and we were impressed by its colour as it was a blue-green (shown above). The pictures we had seen in books and on the internet showed a more yellow-green. The first moth was followed by three more, none of which were so blue-green. By midnight the wind had changed direction and we were no longer sheltered, so we decide to pack up and go back to the cottage. On our return we were amazed to see just how successful the light in the window had been. The temperature was still about 18C, and in the shelter from the wind the moths had flocked to the light. Imagine our surprise at the irony of finding two Tree-lichen Beauty at the window. Whether these were migrant moths or local residents we will never know, but they were accompanied by several common migrants including singles of Diamond-back Plutella xylostella, Rusty-dot Pearl Udea ferrugalis, Rush Veneer Nomophila noctuella, Silver Y and two White-point . Then came a real surprise. As we were searching through the moths on the window a Beautiful Marbled appeared on the window sill. After this we decided to go in and rather than go to our beds we would have a cup of tea and check again in half an hour or so. This time there were no new migrants, but there was a Star-wort in really good condition. This was the icing on the cake, as we had been a little disappointed after the initial excitement of finding the worn one earlier in the week. Overall we had a very good weeks mothing in a very poor week of weather. 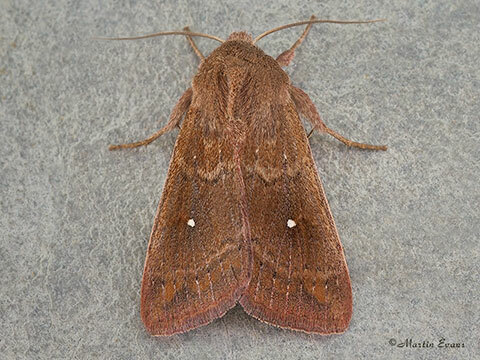 It just highlights the fact that it is not the moths that don't like the bad weather, it is the moth recorders.